It is estimated that over one third of direct and indirect energy (air conditioning units, etc) used to power a UPS is wasted because of low efficiency, poor load arrangements and unnecessary equipment being attached. A double conversion ECO UPS with an IGBT input offers a typical efficiency advantage of more than 10%, when compared to traditional six and twelve pulse machines. 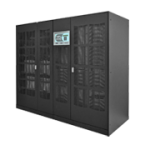 The ECO UPS range remains efficient at low loads when with many alternative UPS topologies the efficiency drops in proportion to the load; ie. low load = low efficiency = higher running costs. 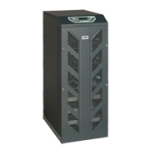 A transformer-less high efficiency UPS when running in its normal On-Line mode, offers AC/AC efficiency of 95% increasing to 98% in DC to AC mode. With Borri’s B9000 the use of DSP, IGBT and tricore technology ensures that the B8000 offers AC/AC efficiency of 95%. The B9600 is designed with an IGBT rectifier and an advanced PFC (Power Factor Control) keeping harmonic distortion at less than 3%.